The customary celebrations of Valentine’s Day have long since vanished from my life. What has taken their place is celebration of a different sort. Here in the Maritime Northwest, the Spring season is already well under way this year. You’ll see photographic evidence of that here and there further down, interspersed with evidence of how I chose to observe the public holiday. For a number of years, I’ve had in mind to weave a series of Valentine’s scarves, having found in a weaving publication a project that contained representational hearts which looked pretty good. But I never got around to it. Until this year, about two weeks ago, when I embarked on a (relative) frenzy of design and weaving. I took the original weaving draft (pattern) from the article I’d saved, entered it into my design program, and did a substantial amount of revamping and redesign until the result suited my vision of a woven Valentine’s card, complete with lacy borders. Using silk noil and tencel in equal amounts in the warp, I raced through the warping process. And the weaving. First, with a fine purple pearl cotton. A different angle on the cloth gives a fresh perspective on both pattern and color; this is why I persist in using shiny yarns which reflect light in interesting ways. 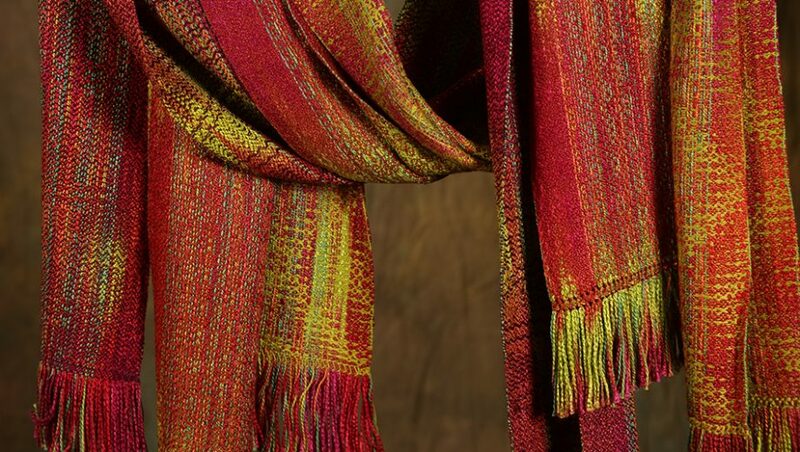 The third (and last) scarf in this series — which I’ve named “Heart-Throb” — was woven with a deep red fine bamboo, less lustrous and more textured than the tencel, and therefore resulting in quite a different effect than the two previous ones. The finished dimensions of these three are about nine inches by 78 inches, plus fringes. And a last floral treasure, a bouquet of seedling hellebores, for you.